Geezer Pat Ryan is always coming up with some interesting and outrageous ideas for the geezers. It must be the Irish in him that makes him so creative. Yesterday he suggested to us that we should have a Hawaiian Shirt Day today. The day was to commemorate the arrival of sunshine and Spring skiing. Pat and I complied with our Hawaiian themed outfits. And Roger at least came up with a plaid shirt. That plaid shirt must have come from his Maine roots when he was doing some logging. I was able to get a Hawaiian shirt from the Salvation Army store since I didn't have one. The other geezers have an assignment for next year to get their own shirts. Pat and Gerry - Great Legs Pat! 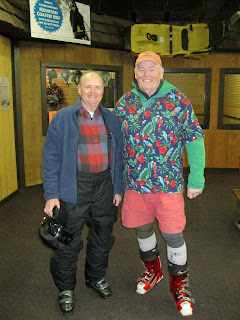 Pat and I brought smiles to the faces of almost all of the skiers on the slopes. The lift attendants and the Greek Peak staff also enjoyed our little escapade. We only regret that many of the geezers have hung up their skis for the season and are missing these last few days at the hill. There were semi sad farewells today, since almost all of the geezers are done for the season. We will be off to our off season pursuits of golf, travel, fishing and tennis. However, most of us have bought our season passes for next year and we are looking forward to another great season and the Second Annual Hawaiian Shirt Day in the Spring of 2014.